A message on the Ubuntu Art mailing list announces that the new Ubuntu 10.10 countdown banners are now available to use in your website or blog. 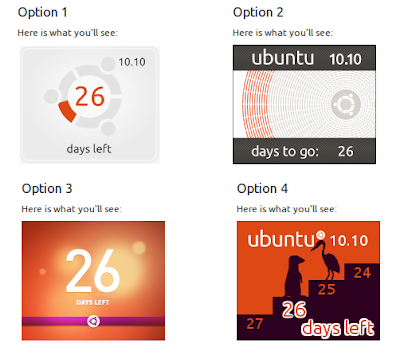 Get the official Ubuntu 10.10 countdown banners from here (turn off Adblock to be able to see the banners). For more, unofficial banners (like the cool one we have on WebUpd8 above the tabbed menu on the right), see the Ubuntu 10.10 countdown banners page @ Ubuntu Wiki.